When gutters, downspouts, and splash blocks are properly installed, your foundation will stay drier and your siding will stay cleaner. 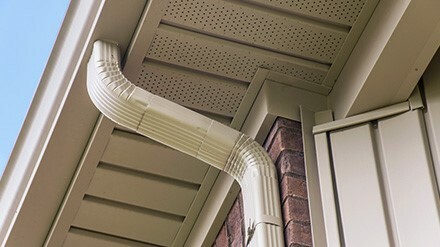 Ensure that your residential or commercial property has a proper drainage system with expertly manufactured and installed gutters and downspouts from ABC Roofing & Siding. We make customized seamless aluminum gutters and downspouts right at the job site to create the best fit and give your building a clean, professional look. We also offer a variety of gutter guard and screen options to manage the hassle of leaves and other debris. Ask about the different sizes, designs, and colors that are available. Up there behind your gutters and below your roof, soffits and fascia are features you don’t think about too often. Still, soffits and fascias take a lot of wear and tear from the elements while protecting your residential or commercial property. Let the experts at ABC Roofing & Siding take care of them and ensure they give you years of service. You can have us repair or fully replace your soffits and fascias with different styles and colors to choose from. Choose full wood replacements or, for added protection, have us cap your wooden soffits and fascias with durable aluminum. While we’re up there, we also can add more ventilation, which will help keep your home cooler in the summer months and reduce energy costs. Check out what our satisfied customers have to say about ABC Roofing & Siding at HomeAdvisor. Your place to find trusted local pros for any home project.